It's Day 9 of the 12 Days Challenge! WOW! Already? Time really flies I must say. So beautiful people, how did your Day 9 go? 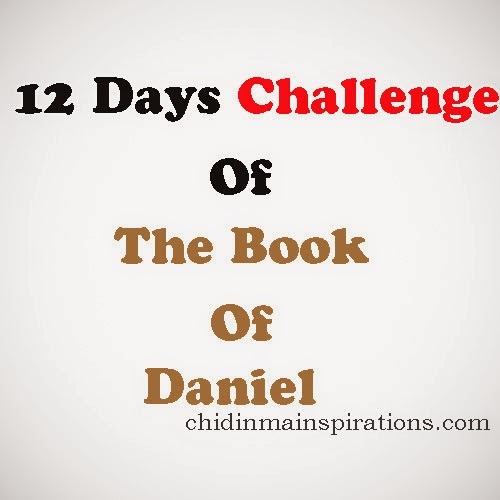 Did you study the 9th Chapter of the Book of Daniel? If you did what did you learn from it? Do you have any questions you have to ask us? Please do share with us, let us inspire one another. My today's challenge went well. I bless God. Today's chapter is all about making supplications to God, begging God for mercy and for grace to render justice with mercy. When you are relentless in your prayers, God will surely render justice with mercy. He will surely provide you with the answers you need even way more than you ever asked for. What a faithful, gracious and merciful God we have. So beautiful people, please do share with us, what you learnt in today's challenge.